Home/Posts/Key Stage 5 performance tables 2018: Where have all the applied general entries gone? We don’t say an awful lot about post-16 performance tables. There are a number of reasons for this. Firstly, they cover such a wide mix of different qualifications, with different measures for different types of qualification. Secondly, the data has historically been affected by students moving between institutions or dropping out altogether. The sheer number of footnotes in the Department for Education’s statistical release on A-Levels and other 16-18 results indicate how hard it is to make sense of it all. But several numbers leap out this year. The first is that the number of students completed two years of advanced level study fell from 429,000 in 2016/17 to 327,000 in 2017/18. 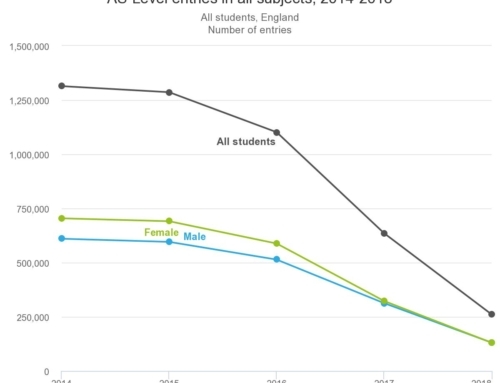 Numbers entering A-Levels increased; the decline comes from those entering applied general (e.g. BTEC) and technical qualifications. Not only that, the average points per entry in applied general qualifications fell from 35.7 to 28.3. In terms of notional A-Level equivalences, that’s from midway between grade B and grade C to below grade C.
This year, a whole raft of qualifications approved for 16-19-year-olds were deemed ineligible for performance tables as part of the DfE’s ongoing reforms to vocational qualifications. 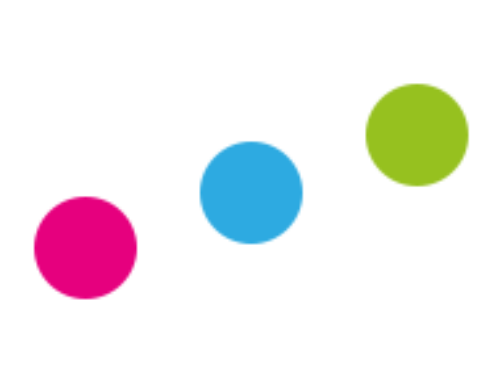 These included the most popular type of Level 3 applied general qualifications, the BTEC, whose popularity has risen markedly over the last 10 to 15 years. The rise in numbers has coincided with a rise in grades. We have previously expressed concerns about the equivalence of BTEC to A-Level and these appear to have been shared by Ofqual. So are there really fewer students taking BTECs all of a sudden? We don’t think so. Although BTECs eligible for the post-16 performance tables were available in almost all subject areas, it appears that schools and colleges have chosen en masse to continue offering legacy qualifications, that are no longer eligible. Today’s DfE release shows that there were some 177,000 students who took an approved Level 3 section 96 qualification, not including those classified as tech levels. These are qualifications which can be publicly funded. This is far higher than the 46,000 who took an eligible applied general qualification. Not all of these will be ineligible applied general qualifications but many will be. Annoyingly, Pearson do not make freely available grade statistics for their BTEC qualifications (even though most are publicly funded). This would allow a better comparison of grades between reformed and legacy BTECs and a better idea of just how many legacy BTECs were entered. The result of this is that we will begin to see a fall in the percentage of 18-year-olds educated to Level 3 when the next statistical release on attainment of 19-year-olds is published later in the year. We have already seen an apparent fall in the percentage of 19-year-olds educated to Level 2 following changes to Key Stage 4 performance tables. Should all approved qualifications be included in national statistics about the attainment of young people? Performance tables could continue to report on the qualifications favoured by the government of the day but we think the national statistics really ought to include all approved qualifications. How many young people could have achieved a higher grade in an applied general qualification if their school or college had offered the legacy specification? If they achieved lower grades than they would have done in a legacy qualification did this have any further consequences (e.g. with UCAS applications)? Are schools and colleges particularly concerned about the reporting of vocational qualifications in post-16 performance tables? Perhaps they are not much of a policy lever after all. They are available with a user name and password. A-Level results 2018: Who is still entering AS-Levels in England? 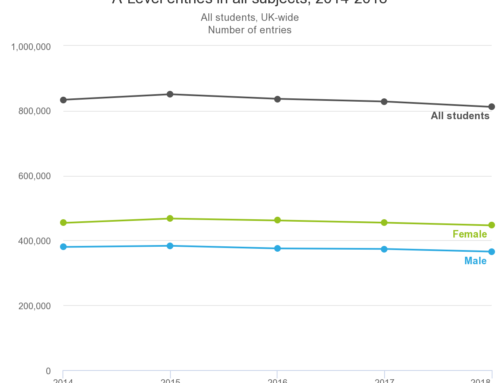 It would be interesting to see what effect there has been on UCAS entries. From my experience this year, anyone who can fill in the form gets and unconditional offer anyway and it doesn’t matter what type of qualification they are doing nor what their predicted grades are. the universities are breaking the level 3 education system in this country.